1969 was a watershed year for motorcycle design. Along with Honda’s ground breaking CB750, Kawasaki also unleashed its mind blowing 500cc H1. Officially named the Mach 3, it quickly earned the foreboding nickname of the “Widow Maker.” A rather interesting moniker considering that most of the teens that scrounged up the less than $1000 purchase price were still single and too young to even consider the realities and responsibilities of married life. Ferociously fast, the 498cc 2-stroke triple sported a 120-degree crankshaft, piston port induction, 5-speed transmission and electronic CDI ignition. With a dry weight of 415 lbs and its high tech engine, fed by triple carbs, this lightweight terror, ultimately cranked out an incredible 60 hp at 8000 rpm! Straight line performance was stunning for the time, with quarter-mile times in the low 13’s at just over 100 mph, and a top speed just under 120 (Cycle World, April 1969). Corners however, were another matter entirely. The flexible frame was prone to high-speed wobbles and the front drum brake was not up to the task and often up in the air! The peaky (wheelie prone) power band caught many young novices by surprise with power hitting hard and rather abruptly around 6000 rpm. Consequently, many off-corner charges became impromptu off-road adventures! Mike Mehak of Toronto restored this clean 1971 Mach 3. It’s hard to believe that it was purchased about 10 years ago as two decrepit basket cases. Mike completed the restoration six years ago and the bike is a regular rider. No stranger to classic bikes he also owns a ’75 Norton Commando, a ’76 Triumph Bonneville, and a ’71 BSA 650 with sidecar. In addition, his son Chris rides a ’66 Honda 305 Superhawk and a ’66 CB160. It’s always great to see the vintage bike hobby being passed down to the next generation. The 500 Kawasaki stands out, however, as the only two stroke in his street going fleet and Mike is quick to relate his nostalgic desire for this particular bike. Back in 1971, a friend allowed him to take a 1969 Mach 3 for a quick spin. As a 16-year-old rider, Mike was shocked by the raw acceleration that the bike delivered and vowed that someday he would have one. All good things come to those that wait and Mike can now thoroughly enjoy his teenage dream bike, with the added wisdom that comes with age to carefully control that wheelie inducing twist grip. Despite early teething problems with the CDI ignition and very poor fuel mileage (barely 30 mpg!) 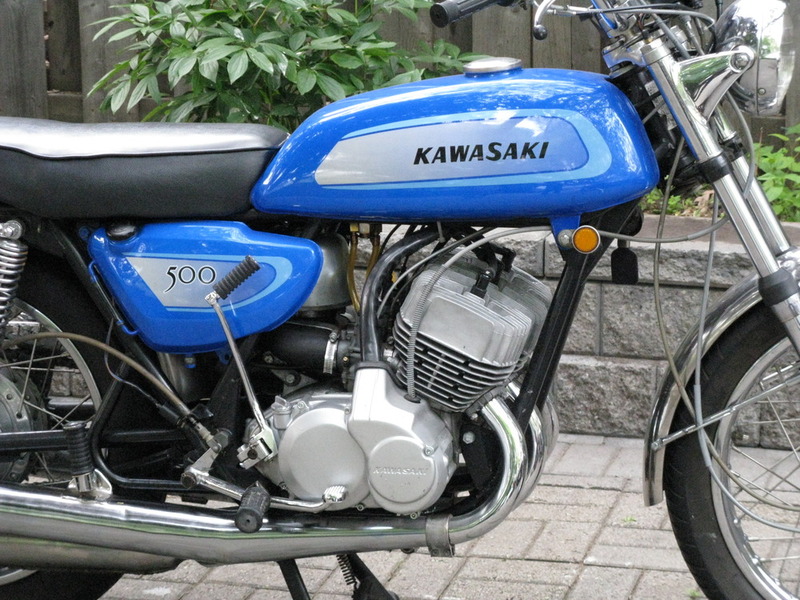 the Kawasaki Mach 3 had a good eight-year long production run, ending in 1976 as the KH500. 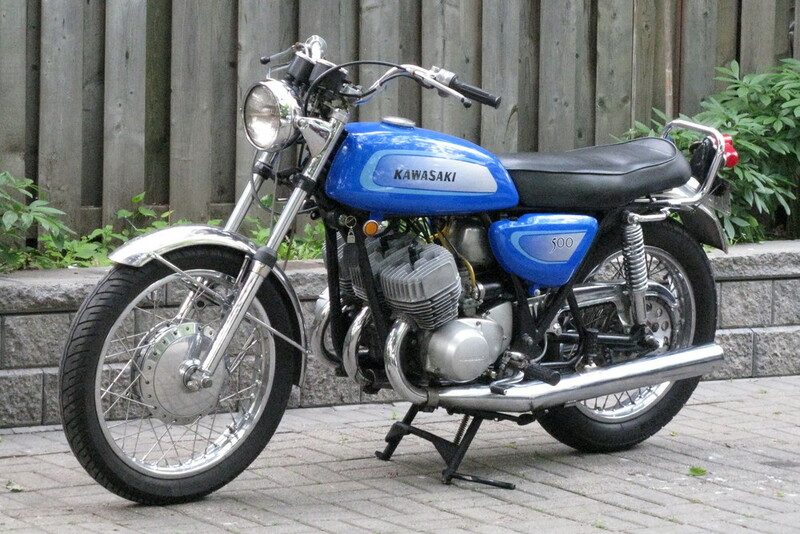 The purest and most collectable examples of this iconic two-stroke are the 1969 to 1971 models, after which they were progressively detuned and restyled. All of the Kawasaki triples seem to have a loyal following within the vintage bike fraternity, from the brutally fast 1972-1975 H2 750 to the diminutive 45hp S2 350 of 1972-1973. Their strong cult status secures their place in history, often rekindling fond and sometimes terrifying memories, when we all cheated death in the foolishness of our youth. The all white Dash 7 floated across my field of vision, its four “rubber-band quiet” engines and props churning the air as it climbed in a graceful arcing south turn out of Toronto’s Island Airport. It was a treat to see one again, immediately transporting my mind back to my early days with DeHavilland back in 1977. I was picking up my wife Irene at our usual meeting spot near her work on Queens Quay at the base of Bay Street in downtown Toronto recently, when this white vision appeared. Being very close to Toronto’s City Center Airport, it is a common sight to see various aircraft types winging skyward for destinations unknown. 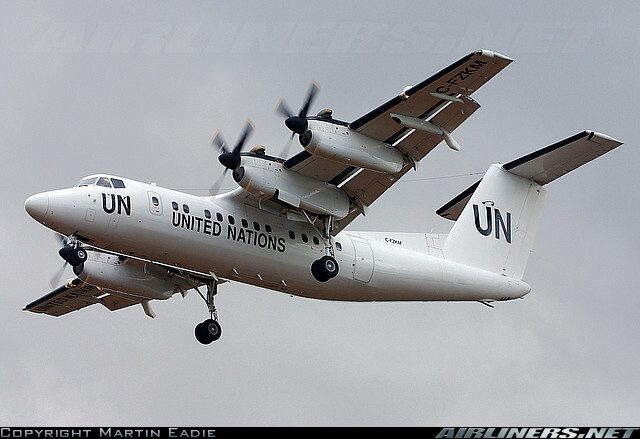 However it was a rare sight to see this white Dash 7 emblazoned with large black letters spelling out UNITED NATIONS doing repeated circuits for my personal viewing pleasure. The Dash 7 has always been one of my favorite aircraft. As a young airframe mechanic working for DeHavilland I worked on the “Sevens” assembly line in the very early days of its production, having a hand in the construction of the first three production aircraft. Later in my career at DH I also helped de-bug these magnificent aircraft as they worked their way through Test Flight. I recall one particular job quite clearly while on the production line. A line foreman called me over to join a group of engineers gathered around a large blueprint near the back of the fuselage. As is often the case with early production the aircraft construction was ahead of the latest structural revision drawings. The rear emergency hatch opening was built up with six skin-doublers when the new revision called for seven. The foreman explained to me that I had to carefully drill out the hundreds of rivets, insert the new doubler, and re-rivet it all with an absolute minimum of oversized rivets. In addition each layer was sealed with PRC compound, which had to be scraped clean, re-sprayed with zinc chromate and re-sealed. This tedious job took me almost three full shifts to complete. Ironically (no pun intended), as I found out later, the entire aircraft was never to fly but instead was installed in the “Iron Bird” a giant hydraulic test rig used for destructive fatigue testing! Another memory from my test flight time concerned some of the early sealing problems with the passenger entry door. Seeing as it was DeHavillands first pressurized aircraft it was not surprising to have a few leakage snags to sort out. As I recall the, then innovative, pressurized door seal was particularly troublesome. They must have eventually worked it out considering the newer Dash 8 used a similar design that was relatively trouble free. The Dash 7 was the result of extensive market research that showed the potential success of using “super quiet” STOL turboprops flying out of inner city airports and short stub runways. Pratt and Whitney Canada worked hand in hand with DH to produce the PT6-50 engines utilizing state of the art Hamilton Standard four bladed props. The combination was a great success giving the aircraft world-class performance with minimum noise. Unfortunately the plan was just a little ahead of its time. Despite niche markets sales such as Rocky Mountain Airways and Spantax Airlines of Spain the sales orders never quite met the companies full expectations. Lack of inner-city airport development, along with a trend toward twin-engine turboprops kept the final production numbers to a total of only 111 aircraft. Despite its excellent in service track record, the Dash 7 never realized the success that it deserved. However on a more positive note, much of its engineering technology paved the way for its successor, the twin engine Dash 8 which has evolved into the excellent, class leading, Bombardier Q-400 series of aircraft. I recently had the pleasure to fly out of Toronto’s City Center airport on one of Porters Q-400’s bound for Halifax, and found the entire experience very enjoyable. Their excellent service and on time scheduling made the grief of large airports like Pearson a distant memory. As we took off I noticed that same white Dash 7 sitting on the tarmac, and immediately realized that DH had the right idea over 30 years ago. I was now flying within the current reality, taking off from a city center airport and in my humble opinion that “old idea” appears to work very well. 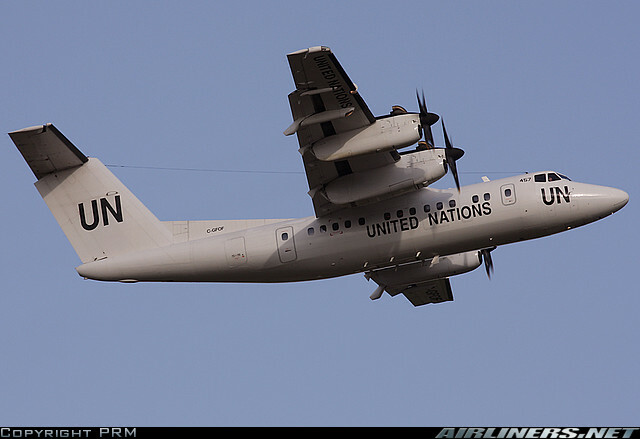 As for the white Dash 7, it was wonderful to see that it was also still working well doing humanitarian service for the United Nations in other countries. Success is measured in many ways, but a great aircraft doing great work should always make us proud. The DeHavilland Dash 7 continues to earn it keep around the world, a quiet reminder to all nations that Canadians have a rich history building truly superb aircraft.